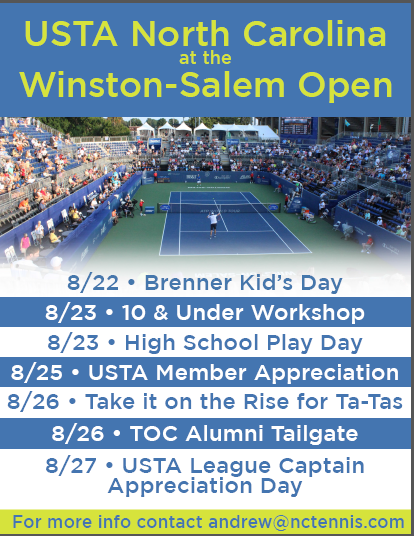 USTA North Carolina and the Winston-Salem Open present "Take It on the Rise for Ta-Tas", a clinic that benefits Earlier.org - Friends for an Earlier Breast Cancer Test. By signing up, you will be able to participate in a tennis clinic with lunch sponsored by Panera Bread. For more information about the event, including how to register, click here. USTA North Carolina and the Winston-Salem Open present "Take It on the Rise for Ta-Tas", a clinic that benefits Earlier.org - Friends for an Earlier Breast Cancer Test. By signing up, you will be able to participate in a tennis clinic with lunch sponsored by Panera Bread. For more information about the event, including how to register,click here.